Урок Посещение достопримечательностей в России и в Великобритании. Рекламный буклет для туристов. -совершенствование навыков чтения. Развитие навыков чтения с полным пониманием личного письма. - умение писать рекламу о достопримечательностях своего города. Оборудование: картинки по теме "Достопримечательности". Интерактивная доска. I'm glad to see you. 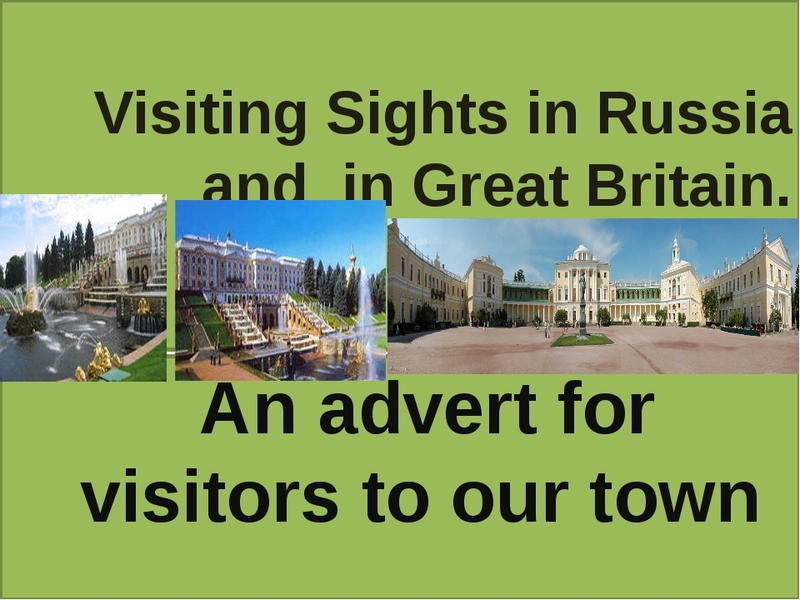 Today the theme of our lesson is " Visiting sights in Russia and Great Britain". Today we'll talk about places of interest. 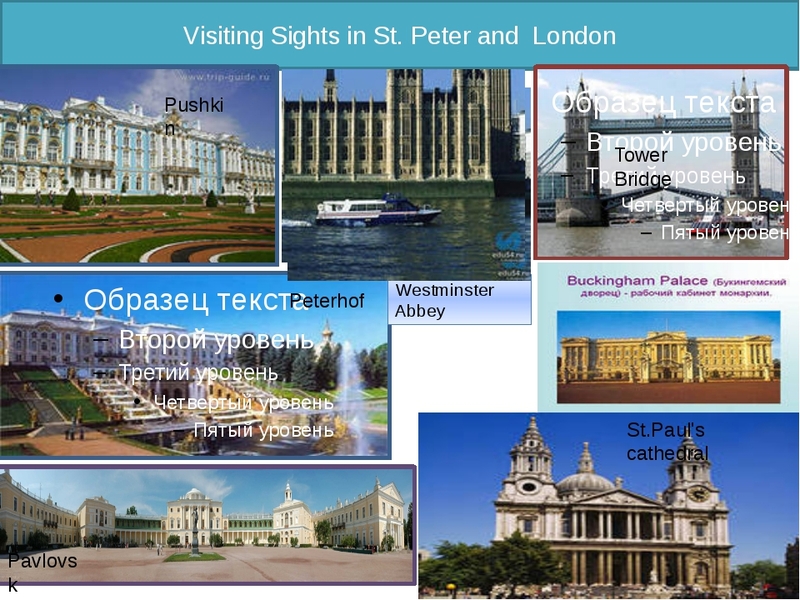 We'll visit St. Petersburg and London. And we'll do some exercises, answer the questions, revise comparative and superlative adjectives, sing a song, read an advert for visitors to our town. 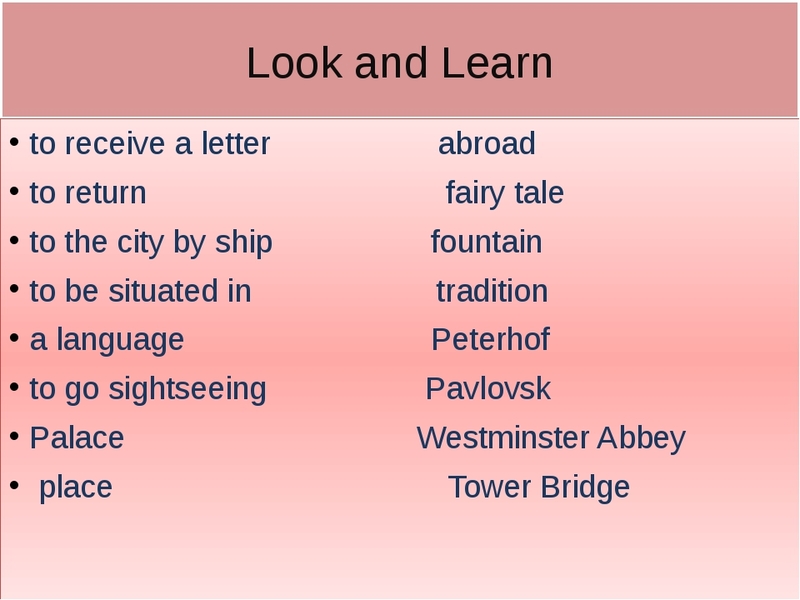 Let's begin our lesson with the revising new words. Look at the blackboard! Listen to me and repeat after me the new words. • to return fairy tale Russian? • to the city by ship fountain -Who can translate the words? - Listen to me attentively and answer my questions? - Where did you spend your summer holidays? - Where would you like to spend your summer holidays? (I would like to spend my holidays in London. - We have received a letter from London. The letter was written by Martin. He wrote about visiting St.Peter and such places as Pushkin , Peterhof and Pavlovsk palaces in his letter. I'll check your understanding the text by the questions and some exercises. Look at the exercise 79. Let's read the questions. Who will be the first? Masha, read the first question please! • 1) Where did Martin spend his summer holidays? • 2) What places did he visit? • 3) What palace did he like best of all? • 4) What Martin’s Dream? 5) what can he do already? - The next task is to complete the following sentences. 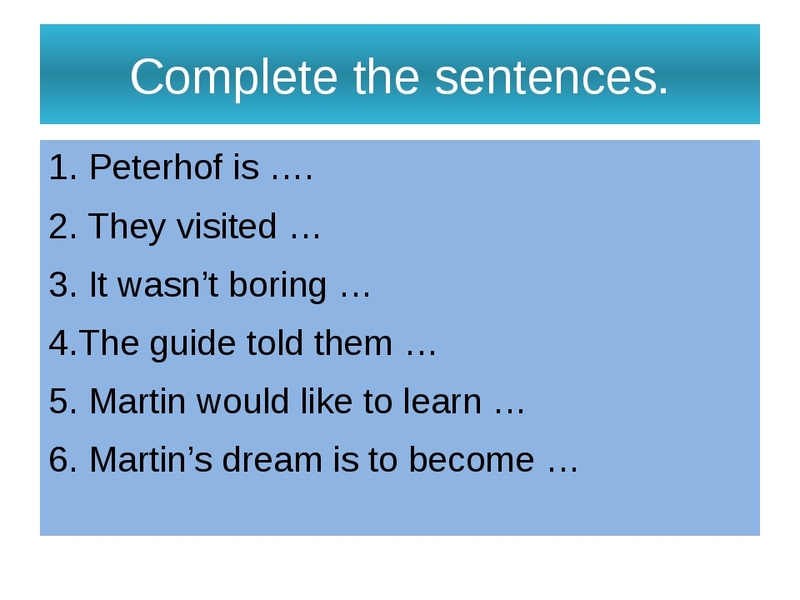 Look at the blackboard and complete the sentences.Use the information from Martin's letter. 6) Поездка в Питербург. Презентация. - We spoke about sights in St. Petersburg. We named such sights as: Pavlovsk, Pushkin and Peterhof. Here you can see a lot of pictures of these palaces. And now I want to show you all these beautiful and great sights. Let's visit St. Petersburg together . - Let's play a game. Look at the blackboard. 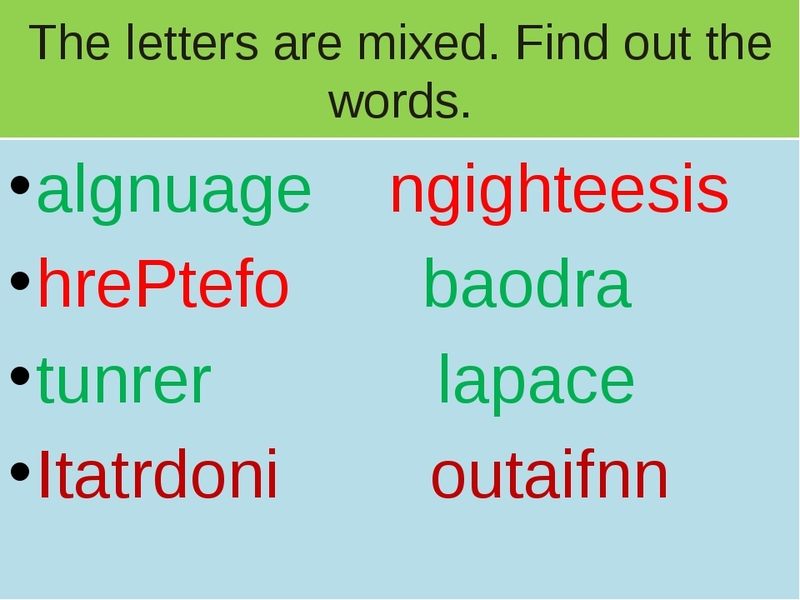 The letters are mixed. Find out the words. 8) Ex. 86, p. 29. Совершенствование навыков чтения и монологической речи. - We also get a letter from Russia. The letter was written by Lena to Martin. Look at the exercise 86. Who can tell me what letter is about? What did she write in her letter? Pupils - She also travelled a lot this summer. In August she went abroad. she spent two weeks in Cambridge in a summer school camp. 9) Путешествие по Лондону. Презентация о Лондоне. - We have never been to London. But we have heard and read a lot about the city. And now we can visit London. Look at the blackboard. Let's visit London together. 10) Песенка на английском языке " Tower Bridge"
- Let's have a little rest. Sing a song "Tower Bridge" together. Pupil - I live in the town of Meleuz. Meleuz is not far from Ufa. It is not large but nice. My native town is situated in a very picturesque place. The landscape in this part of the country is beautiful. Meleuz is in some way a cultural centre of the district. There are two modern cinema halls, a concert hall, a museum, a music school, an arts school, a church. There's a big department store and several small shops in the town. My town is famous not only for its beauty but also its people. So my native town is a nice place to live in. The life is quiet nice and peaceful. You are most welcome to visit my town. 1) Moscow is… than St.Petersburg. 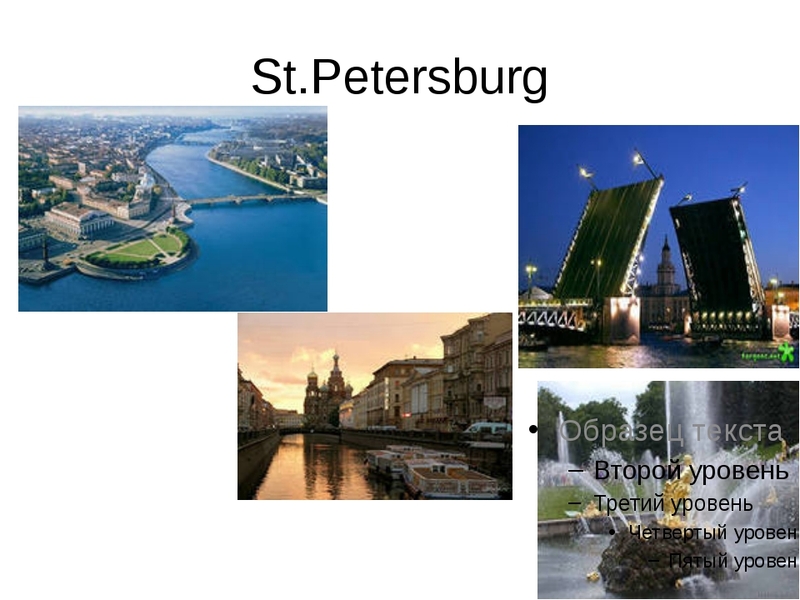 4) St.Petersburg is one of … cities in the world. 5) Moscow is …city in Russia. - You worked very hard. The lesson is over. You may go.